With the presence of a large pool of participants, the Global acromegaly treatment market is displaying a highly competitive business landscape, finds a new research report by Zion Market Research (ZMR). Pfizer Inc., Chiasma Inc., Novartis AG, Ipsen Biopharmaceuticals Inc., Wockhardt Ltd., Troikaa Pharmaceuticals Limited, and GlaxoSmithKline plc are some of the key vendors of acromegaly treatment across the world. These players in acromegaly treatment market are focusing aggressively on innovation, as well as on including advanced technologies in their existing products. Over the coming years, they are also expected to take up partnerships and mergers and acquisitions as their key strategy for business development, states the acromegaly treatment market study. As estimated in this report, the global acromegaly treatment market stood at US$ 665.0 million in 2016. 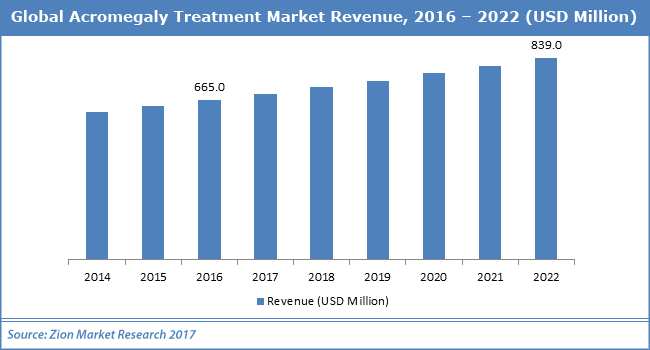 Witnessing a tremendous rise during the period from 2017 to 2022, the revenue in this acromegaly treatment market is expected to reach US$ 839.0 million by the end of the forecast period. The main disease types available in this acromegaly treatment market are ectopic acromegaly and pseudo acromegaly. Among them, the demand for pseudo acromegaly is relatively higher and the trend is anticipated to remain so over the next few years, notes the research report. “High unfulfilled needs observed in the emerging economies and enhanced epidemiology for the disease with rise in incidences of tumors are expected to accelerate the growth of acromegaly treatment market in the years to come,” says the author of this study. Apart from this, massive awareness about the disease and research & development activities pertaining to drug discovery for finding permanent disease cure will favorably influence acromegaly treatment market price in the near future. Regionally, North America has been leading the worldwide acromegaly treatment market and is anticipated to continue on the dominant position in the years to come, states the acromegaly treatment market study. High economic growth witnessed in regions such as U.S. and Canada is the main factor behind the dominance of the North America acromegaly treatment market. Comprehensive research & development activities related to drug discovery along with large cases of pituitary tumor in North America is another significant factor that is supporting the growth of this regional acromegaly treatment market. In addition, high disposable incomes of the population in North America and favorable reimbursement policies are expected to contribute substantially towards the regional growth.